This is another in a series of “Maraphors”, a punny term coined by Ray Johnston describing malaphors involving horses, which it turns out is quite a few (type in horse in the search field on the website and you will see). This nice mash up of “you can lead a horse to water, but you can’t make him drink” (even favorable circumstances won’t force someone to do something one doesn’t want to) and “beating a dead horse” (a particular request is already resolved and any attempt to continue is futile) was uttered by mistake by malaphor follower azrielle. Thanks Azrielle for passing this one along! 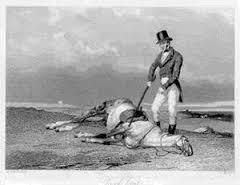 Regarding the expression “beating a dead horse”, the first recorded use with its modern meaning is by British politician and orator John Bright, referring to the Reform Act of 1867, which called for more democratic representation in Parliament, an issue about which Parliament was singularly apathetic. Trying to rouse Parliament from its apathy on the issue, he said in a speech, would be like trying to flog a dead horse to make it pull a load.